Why settle with the ordinary when extraordinary is within your grasp! The Swift Eaglet Series is a MUST SEE for all outdoor enthusiasts and law enforcement officials. If you haven't looked through a pair of these binoculars, you are missing one of the world's best views! 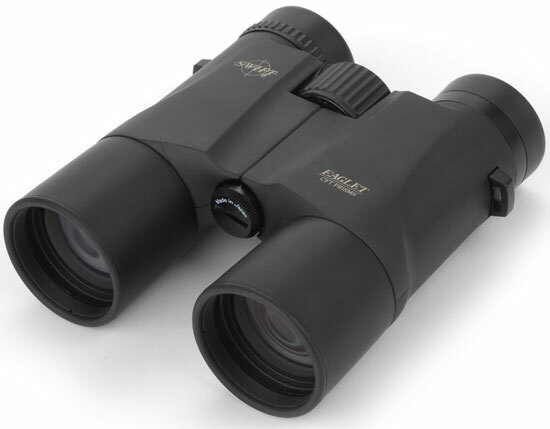 This lightweight roof prism binocular with phase coating offers unsurpassed optical quality. Its Kellner Ocular System and three objective lenses eliminate spherical aberration and reduce astigmatism, which results in especially high resolving power. In addition, the Eaglet boasts the latest advancement in prism coating technology. CFT (Cold Fusion TechnologyTM) is the unique process of applying multiple coatings to the surface of each roof prism without exposure to high temperatures, thereby protecting the integrity of the prism surface. This process increases reflective performance up to 99.8%, enhances brightness and color definition making this glass ideal for dawn to dusk use. The Swift Eaglet Series comes complete with a neoprene neck strap, rainguard and tethered objective lens covers, microfiber lens cloth and padded field case.